In the Labyrinth, the player shoots enemies and yellow barriers to reach the blue warp panel. The player, now in spaceship form, battles the boss creature Optomon in the "Dungeon". ↑ Although her name is never stated in The Guardian Legend, she is given the nickname Miria (ミリア?) and described as a "System D.P." cyborg in Guardic Gaiden. ↑ Naju is described in many ways: as a "huge world" and a "star" in the American release, and as a "capsule" and a "planet" in the original Japanese game. ↑ The original Japanese name for the Lander creatures is Randā (ランダー?). The names of similar items in Guardic and the NES version of Zanac are romanized as "Randar" and "Render", respectively. ↑ (in Japanese) Guardic Gaiden Instruction Manual, p. 9. "「システムD.P.」（愛称ミリア）地球外のノウホウで造られた女性戦士。彼女自身がこのプロジェクトなのだ。 ['System D.P.' (nickname Miria), female warrior built with extraterrestrial know-how. This mission is hers alone.]" ↑ (in Japanese) Guardic Gaiden Instruction Manual, p. 3. "「ナジュ」というこの物体ははるか過去、人類と格別の｢存在｣が落とした用途不明の巨大なカプセルだった。 [This huge object—known as Naju—was a giant capsule of unknown purpose sent off by an alien existence years ago.]" ↑ (in Japanese) Guardic Gaiden Instruction Manual, p. 5. "戦いは惑星の外周「ラビリンス」と惑星の内部「ダンジョン」の中にある21のコリドールで繰り広げられる。 [The struggle unfolds over the planet's surface (the Labyrinth) and the 21 corridors in its interior (the Dungeon).]" ↑ (in Japanese) Guardic Gaiden Instruction Manual, p. 13. "この惑星では５つの種族がなわばり争いをしているのだ。 [5 tribes are warring over territory on this planet.]" ↑ 9.0 9.1 The Guardian Legend Instruction Manual, p. 10. ↑ 10.0 10.1 10.2 10.3 The Guardian Legend Instruction Manual, p. 7. ↑ 11.0 11.1 The Guardian Legend Instruction Manual, p. 6. ↑ (in Japanese) Guardic Gaiden Instruction Manual, p. 11. ↑ "Classified Information". Nintendo Power. 3: 54. November–December 1988. Collect six Number 6 chips and use the option when there are a lot of characters on the screen. They'll all turn to Blue Renders which you can collect for 1-Ups. ↑ 20.0 20.1 20.2 "The Guardian Legend for NES". GameSpot. สืบค้นเมื่อ 2009-01-14. ↑ Dobson, Jason (2008-02-07). "Atlus signs 'family-friendly' Wii puzzler Octomania for North America". Joystiq. สืบค้นเมื่อ 2008-07-24. ↑ 22.0 22.1 Thomas, Lucas M. (2008-10-10). "Retro Remix: Top 10 Unreleased NES Hits". IGN. สืบค้นเมื่อ 2009-07-15. ↑ "Pak Watch". Nintendo Power. 4: 86. January–February 1989. ↑ "Pak Watch". Nintendo Power. 5: 104. March–April 1989. ↑ "Nester's C.E.S. Report". Nintendo Power. 5: 15–18. March–April 1989. ↑ Carlsen, Clifford (1990-09-10). "Broderbund Software Inc. jettisons Nintendo, games". San Francisco Business Times (San Francisco, California). p. 1. ↑ 28.0 28.1 28.2 28.3 Harris, Steve; Semrad, Ed; Nauert, Donn; Allee, Jim (September–October 1989). "Electronic Gaming Review Crew". Electronic Gaming Monthly. 3: 11. ↑ 30.0 30.1 "Classic GI". Game Informer. 179: 114. March 2008. ↑ Bieniek, Chris (January 1990). 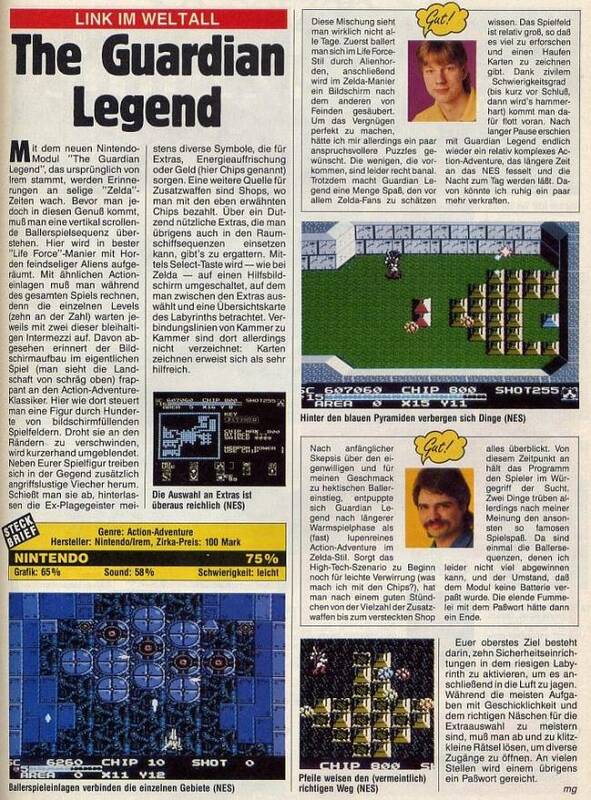 "Video Game Reviews – The Guardian Legend". VideoGames & Computer Entertainment. 12: 28, 30. ↑ "Top Secret – Tricks of the Trade". Electronic Gaming Monthly. 3: 34. September–October 1989. ↑ "Nintendo Power Top 30". Nintendo Power. 8: 82–84. September–October 1989. ↑ "Nintendo Power Top 30". Nintendo Power. 16: 22–24. September–October 1990. ↑ "Nintendo Power Awards '89". Nintendo Power. 11: 96–99. March–April 1990. ↑ "Nintendo Power Awards '89". Nintendo Power. 12: 26–29. May–June 1990. ↑ "The Guardian Legend". Nintendo Power. 9: 69–71. November–December 1989. ↑ Thomas, Lucas M. (2005-08-18). "'Sigma Star' Combines RPG, Shoot-Em'-Up Action". Evansville Courier & Press. p. D11. Archived from the original on 2009-06-25. สืบค้นเมื่อ 2008-06-25. ↑ Ng, Stephen. "Top 100 NES Games of All Time". IGN. สืบค้นเมื่อ 2009-10-13. ↑ Szczepaniak, John (2009-02-12). "Interview: On Localizing Retro Game Challenge". Gamasutra. สืบค้นเมื่อ 2009-03-20. ↑ Amjadali, Samantha (2002-03-31). "Computer Game Composers". Sunday Herald Sun (Melbourne, Australia). p. 80. ↑ Theakston, Rob. [เดอะการ์เดียนเลเจนต์ ที่ออลมิวสิก "Elf Titled – Overview"] Check |url= value (help). Allmusic. All Media Guide. สืบค้นเมื่อ 2008-06-30. หน้านี้แก้ไขล่าสุดเมื่อวันที่ 31 มกราคม 2560 เวลา 04:26 น.